we are looking for a component for our development team which enables us to convert emf files into pdf using vectors so we can have a very low file size. Also we would like to use this converter as part of our software and give it back to our client via stream (web client) without going over the virtual printers or the file system. We are looking and VeryDOC and VeryPDF first is this the same company and which product fits our requirements? Do you have an example / trial we can use? If you just need EMF to PDF Conversion function, the #1, Metafile (EMF and WMF) to PDF Command Line will meet your requirement. The #2 EMF to Vector Converter Command Line (EMF2Vector) converts enhanced metafiles (EMF) and Windows metafiles (WMF) to PDF, WMF, EMF, PS (Postscript), EPS, SVG, SWF, XPS, HPGL, PCL etc. 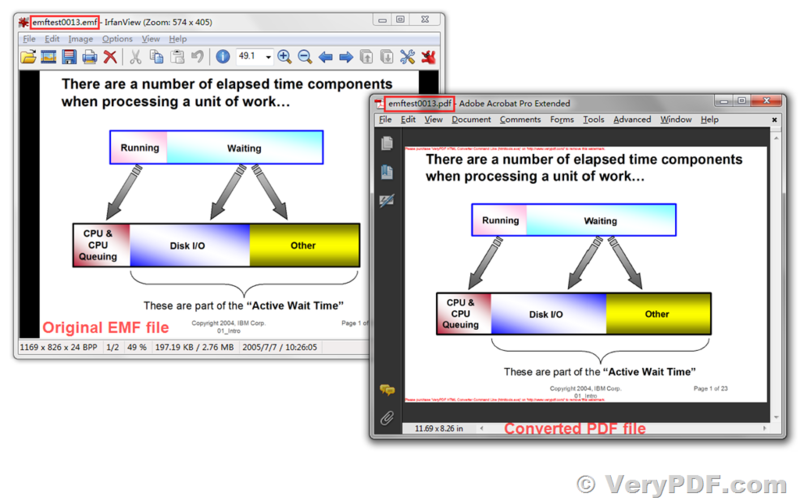 vector formats while preserving the vector and text information. EMF to Vector Converter is can also convert EMF and WMF files to raster image formats, such as BMP, GIF, JPEG, PNG, TGA, PCX, PNM, RAS, PBM, TIFF etc. The #3 htmltools.exe does convert from HTML, URL, EMF and WMF files to PDF and other formats. If you wish integrate our products into your products and distribute it along with your products to your customers, you need purchase the Developer License from us, the Developer License is royalty free, after you purchase the Developer License, you can integrate our product into your product and distribute it along with your product to your customers royalty free, you needn't pay the annual fee or renew the license annually. This entry was posted in Metafile to PDF and tagged emf to pdf, metafile printer, metafile to pdf, wmf to pdf. Bookmark the permalink.